Aphids are one of the most common pests that afect crops, with the greatest economic impact, and which act most quickly. The 4,000 identified specied of aphids cause direct damage to the aerial parts of the plant, but they can also be vectors of phytopathogenic viruses. They attack garden, orchard and cereals. Some 500 species of aphids are harmful to crops and gardens. And more than 200 species are capable of transmitting viruses. 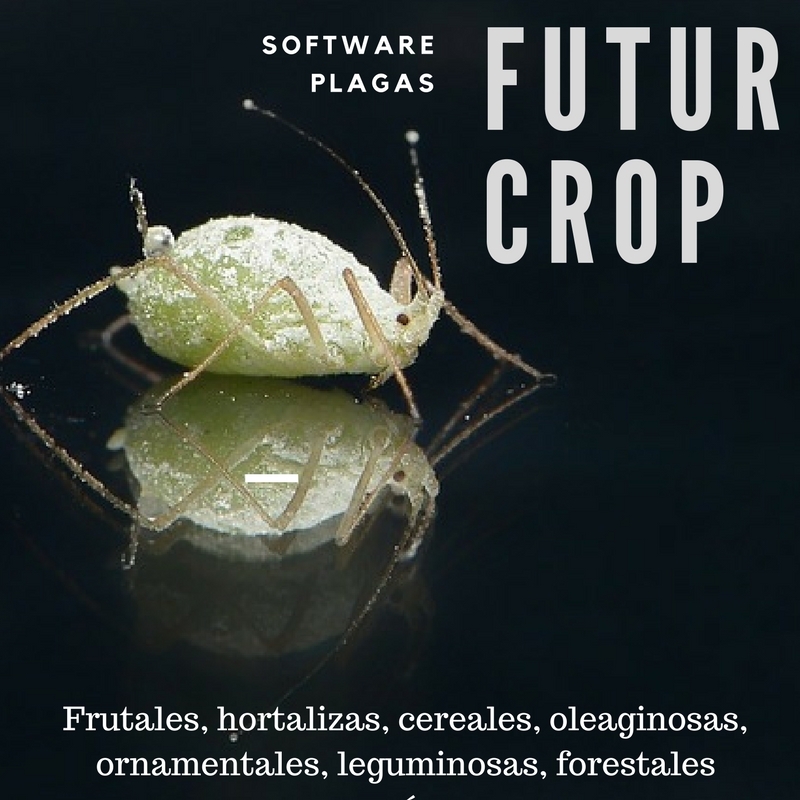 FuturCrop is a software that controls the development conditions for the following species: Aphis fabae, Aphis gossypii, Myzus persicae, Macrosiphum avenae, Rhopalosiphum maidis, Diuraphis noxia. FuturCrop is decisive for the early detection of the pest, and its effective treatment. As diagnosing the problem early can help minimize the consequences, the software automatically sends infestation risk alarms. Aphids feed on the sap of plants, which have a lot of sugar and few proteins. Therefore, aphids must consume a lot of sap to satisfy their protein needs. The excess of sugar makes them excrete large quantities of a kind of molasses that attracts ants, which protect, transport and care for aphids. During autumn females and winged males mate and lay eggs that hibernate until the following spring. From these eggs females are born that reproduce by parthenogenesis (basically, clones of adults). A female can carry inside its body young clones in development, and these can develop other aphids inside inside them. 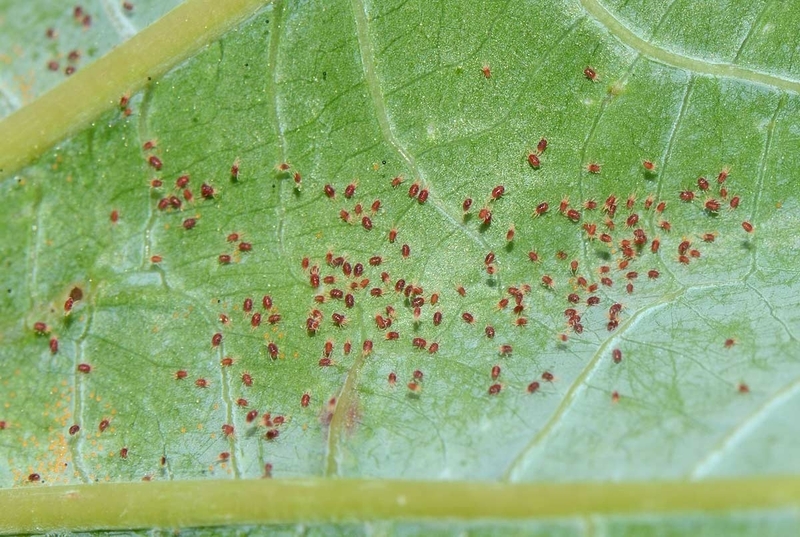 Aphids do not require to pass mild winters as eggs. So there can be adults and nymphs throughout the year. Aphids can alternate several generations of asexual reproduction. For example, if the conditions are not favorable for the colony (ie. the plant has died or the environmental conditions are no longer adequate) the new adults are winged females that can give birth by parthenogenesis. They are in fact new founder females that colonize other plants. On average, a female produces between 50 and 100 eggs per cycle, and the new specimens only need about a week to mature and start its reproduction. In some species, each female aphid can develop up to 40 generations during a single season. The most frequent treatment of aphids use pesticides. The use of pesticides has increased considerably over the last 35 years, reaching growth rates of 4 to 5.4 % in some regions. In the 90´s there was a decrease in the use of insecticides. In the future it is foreseeable that their use will be gradually restricted by laws and taxes. Generally speaking, predicting the attack of pests is the most efficient way to combat them, while reducing the use of pesticides and costs. Attention should be paid to and monitor the presence of this pest, especially in dry years with mild temperatures. The rain detach them from the plants, diminishing their damage; while temperatures above 30ºC prevent its multiplication. 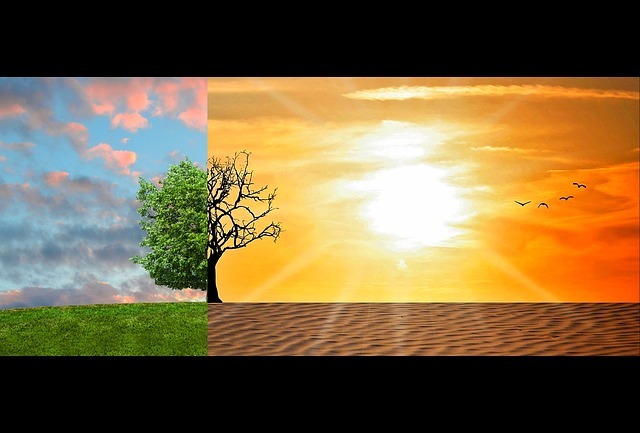 But climate change and the increasing of temperatures complicates what until now was its usual biological cycle. The ideal solution consists in a software of automatic control of the conditions of pests development, a system of email warnings on this information and a system predicts its biological cycle with 10 days of advance, that allows to plan and treatt before the population reaches severe levels of infestation. Using FuturCrop it is possible to use the appropriate product for the phase in which the aphid is (eggs or adults) and easily to identify the species that affects the crops, so that it is easier to choose the active material to use (which depends on the aphid, since it has been reported different resistance to the pesticides). It has a short life cycle, with 5 biological stages. It has a high reproductive rate. The normal proportion of females and males in a standard population is 3: 1. The most used method for its control is the use of agrochemicals. However, its excessive and indiscriminate use has caused its resistance to more than 92 acaricide-active substances. For this reason, treatments with acaricides should always be done when living forms are observed, and not in a preventive way or by observing only symptoms. FuturCrop is a software with which you can receive notices of risk and biological development of the red spider mite. It will notify you the moment in which it is convenient to carry out monitoring, because the program has calculated when the probability of development of the pest is high. The software will help you to make the application of the treatment knowing the state of development of the mite. In this way you can make the choice of the most appropriate product: ovicides, larvicides, adulticides. 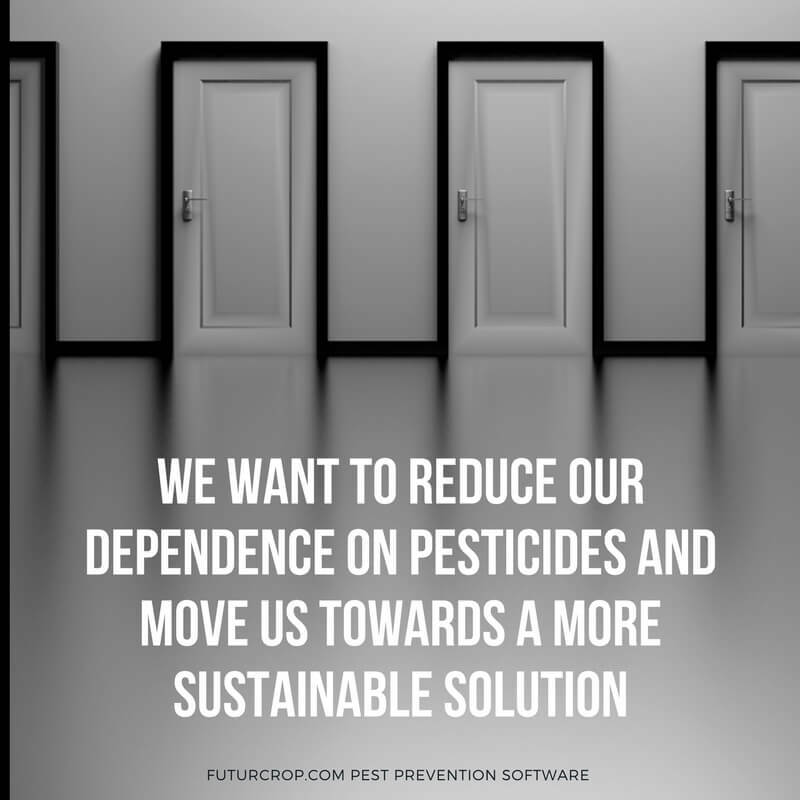 With FuturCrop you can plan the application at the moment of expected greater proportion of sensitive forms of the pest. 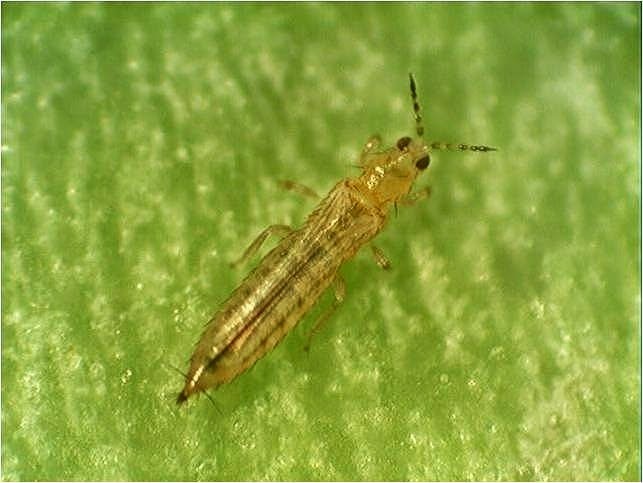 The dynamics of the thrips population can become uncontrollable, depending on factors such as temperature, reproductive capacity, variable number of generations, etc. A high percentage of treatments are carried out late, when the situation already has a difficult solution. To carry out an effective control it is necessary to have the ability to predict the moments of development of the pests. Because that way monitoring and treatments are efficient. FuturCrop is a new software that does is worldwide. Try it free for 2 months and let the program control automatically the development of the pests that can damage your crops. You´ll receive warnings in your email. With effective treatments you will save costs. The United Nations Food and Agriculture Organization (FAO) estimates that global agricultural production loses approximately 40% due to pests and diseases. The economic value of these losses was in 2016 approximately USD 40,000,000,000. Controlling these losses can not depend exclusively on the application of chemical insecticides, whose agricultural expenditure amounted to USD 59,000,000 in the same year. 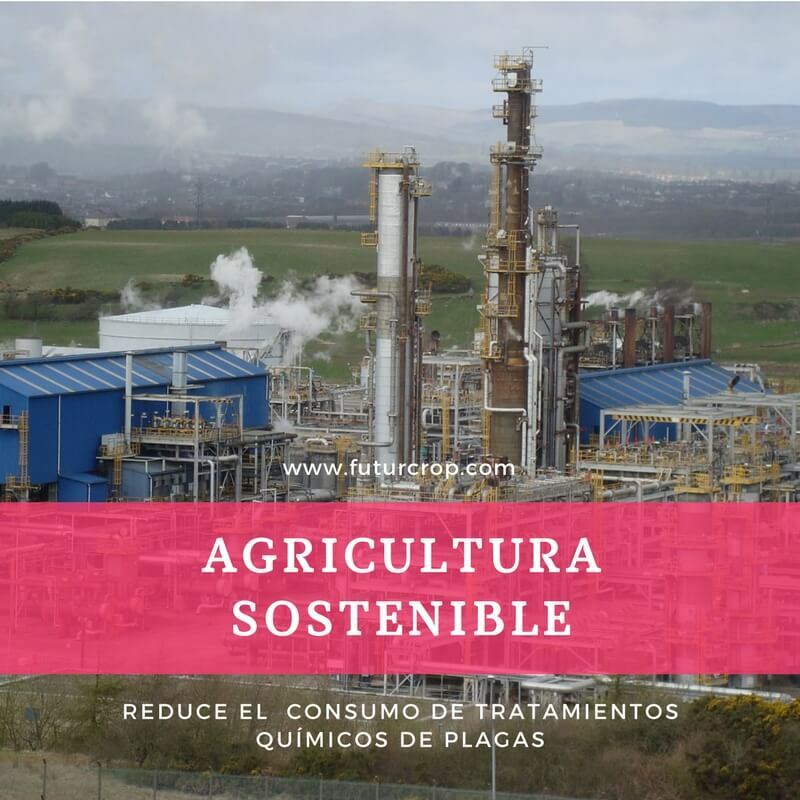 The agriculture of the future will be conditioned by sustainability, producing more and better, without increasing the resources of land and water and, above all, minimizing its environmental impact, obtaining food with a minimum of chemical residues in food. Agriculture needs new technological developments that facilitate decision-making in the consumption of agricultural inputs. Currently, the needs of water or fertilizers are being controlled by sensors. But there were no new technologies that would provide adequate information to optimize an Integrated Pest Management. FuturCrop is a software that has been developed to optimize sampling times and reduce the necessary treatments (both phytosanitary and biological) to the necessary and efficient. Farmers need to visit the field to check and control the condition of the crops and carry out sampling. 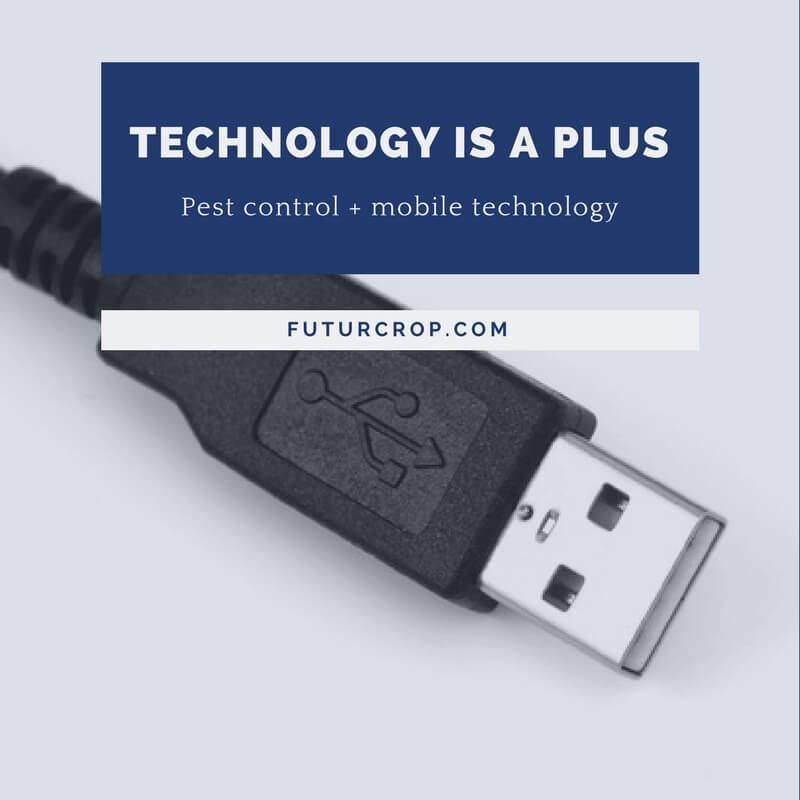 FuturCrop informs about the appropriate moments to carry out samplings in the crops, because it sends alerts of the change in the biological development of the pests. In this way the moment of appearance is controlled, or if its biological cycle is accelerated. It is important to have a prior knowledge of what is necessary to monitor, since the pests have different habits according to their development phase, they differ in their distribution in the crop, as well as the places where they are found.